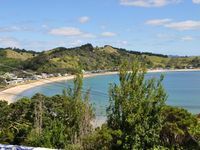 Properties in Taupiri Bay average 4.6 out of 5 stars. Property 21: Kiwi Seaside 1950s Bach, Godwin Cottage. Waterfront - 8 minute walk to Village- Linen optional -see below description. Property 23: Waterfront - 8 minute walk to Village- Linen optional -see below description. Stunning modern Beachfront House at Oakura Beach. 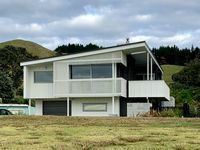 Property 32: Stunning modern Beachfront House at Oakura Beach. Property 35: Peaceful open plan cottage in Orongo Bay, Russell. Oakura Lookout is a comfy bach overlooking Oakura with some water views. Property 47: Oakura Lookout is a comfy bach overlooking Oakura with some water views. Beautiful Bach and excellent spot. House was well equipped with everything you could possibly need. The bach was a typical Kiwi bach with all the basic necessities. Great deck to watch the sun go down while sipping a cold beer. Pets allowed and my little dog loved it.